The paperback book is the product of its compiler, Pablo A. Garcia-Chevesich, Ph.D. The Chilean native has dedicated his life to fighting the encroachment of global desertification. Garcia-Chevesich is a U.S. Ambassador for UNESCO’s International Sediment Initiative and a board member of the International Erosion Control Association (Western Chapter). He sounds the clarion alarm in his book, pointing out that the world loses 36 football fields’ worth of land to soil erosion every 60 seconds. Some of that loss, he asserts, is permanent. The answer to this growing problem is for people to manage land properly and return the eroded acreage to its normal state when possible. Accordingly, the book contains chapters about hydrology and storm runoff, soil erosion, and the various methods of resisting desertification. Chapter 12 starts off with a basic definition of turbidity, then advances to more of a technical treatment of remediation tactics. Turbidity becomes a problem when there is an excess of total suspended solids in the water. As the chapter states, “Turbidity strongly affects water quality and, as a consequence, aquatic and terrestrial organisms. Evidence of the negative impacts of high turbidity in the past decades has been a major factor in U.S. environmental resources protection …” (p. 149). A correctly deployed turbidity curtain promotes government compliance, prevention of fines and shutdowns, and protection of natural habitats. Barge curtain, “a localized and specific turbidity control system designed to keep displaced sediment and solids contained during barge dredging operations” (p. 153). The chapter includes an outline of the curtain system’s various elements: for example, floatation, tension cable, fabric, ballast, and reefing lines, anchor kits, and lights. The reader will also find information and instruction about installation, deployment, retrieval, maintenance, and inspection. The book is available in both English and Spanish. Proceeds from purchases of “Erosion Control and Land Restoration” go to SOIL Fund of the International Erosion Control Association. The fund promotes the science of erosion and sediment control, and works to improve lives adversely affected by erosion and sedimentation. “Erosion Control and Land Restoration” is available on Amazon.com here. Despite the economic benefits new housing or other construction projects can bring to a locale, there’s always a potential downside. Exposed soil and reshaped land are subject to erosion from stormwater runoff. All this water can have a disastrous impact on the environment. If unchecked, the flow into storm drains, sewers and trenches often contain such contaminants as sediment, silt, debris and chemical pollutants. In waterways around the country, sediment pumped out or running off construction sites remains one of the most significant sources of water pollution. Suspended sediment diminishes water clarity, inhibits the growth of aquatic plants and can deprive fish of important food sources. In addition, phosphorus from construction site water often contributes to explosive algae growth. Like most ecological problems, all of these issues can ripple throughout the environment, disrupting sensitive life cycles and ecosystems. Accordingly, government agencies at the state and federal level have tight standards for the quality of water pumped from sites during dewatering efforts. Contractors who run afoul of those regulations can find themselves in the midst of costly project delays and fines. There are cost-effective ways of accomplishing an environmentally responsible dewatering process. Dewatering bags are a common option to effectively trap silt and sediment while allowing water to escape through the bag’s geotextile material. The sediment-laden water is pumped into ports located on the bags. As the water passes through the bag’s filter fabric, suspended sediment particles are caught in the fabric. The bags fill with sediment over time. After the contents dry out, you can cut the bags open and redistribute the sediment. GEI Works carries these bags in its Taurus line of dewatering products. Some dewatering projects call for a substantially larger option to accommodate greater quantities of water – for example, the quantities found in agricultural ponds, paper mills, lagoons and aquaculture sites. Dewatering tubes have much larger capacities due to the strength of the woven geotextile material used. They are ideal for applications requiring large volumes of water to be processed. For small-scale projects, a dewatering sock may be the best choice. 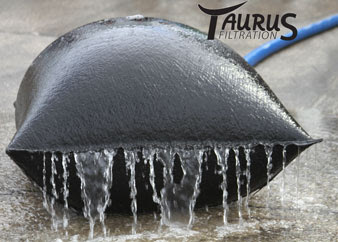 The Taurus Dewatering Filter Socks are available in three diameters to fit different discharge pipes: 8-inch, 12-inch and 16-inch. As water passes through the sock, sediment and debris stay behind to help keep these materials from leaving the job site. There are many options for contractors trying to keep sediment and other pollutants out of waterways. Many can be used in concert with one another. 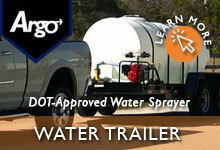 But be sure to use a dewatering solution that’s effective for your particular application. The alternative can be a stiff fine or delay in your work: something nobody wants. Having a water storage solution is a critical part of any government emergency plan, a guard against utility failures or contamination of existing resources. Severe weather events, especially floods, can cut off the supply of safe drinking water to large populations. That’s where tanks play an important role. They dispense urgently needed water during crisis situations, quickly and reliably. Above-ground tanks come in a wide range of materials, such as fiberglass, plastic, and steel. Some are collapsible, such as pillow tanks and onion tanks. These are good choices for fold-able, easy-to-store tanks that can come out at a moment’s notice. Corrugated steel tanks, on the other hand, are a fixed, more permanent option. There are many advantages to our corrugated storage tanks that make them the preferred solution in various applications. They are an excellent choice, not only for emergencies, but also on construction sites where they meet fire suppression requirements. Additionally, they often function as a means of rainwater collection and storage. Long life: Corrugated steel tanks have much greater lifespan than tanks made of plastic or concrete, which is why the ones available at GEI Works carry a 20-year or 30-year warranty. Their durability and resistance to rust help give them superior longevity. With steel corrugated tanks, there’s no sensitivity to UV rays that break down other materials over time. The tanks stay in use after other products have long exceeded their life cycles. Toughness: These tanks resist a number of environmental factors that can damage other models. The corrugated steel construction stands up well against high winds (up to 95 miles per hour) and winter storms. Such ruggedness is an important quality during disasters, when weather can exert great stress. 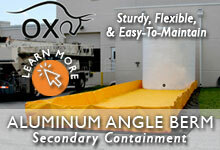 The tank’s flexible liner holds fluids without fracturing under environmental forces. High capacity: Corrugated steel tanks come in a range of standards sizes, with larger models that hold over 600,000 gallons. Regardless of need, there’s a tank size to fit each application. Affordability: Compared to other kinds of tanks with similar capacity – for example, one-piece steel tanks – the corrugated model is a highly, cost-effective option. Ease of shipping: The process of shipping corrugated steel tanks is simpler and more cost-effective than large, one-piece tanks. Because the corrugated steel tank is assembled on site, the shipping size is about 1 percent of its final size after installation. 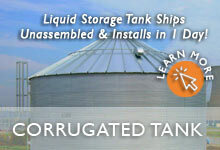 Wide range of uses: Corrugated tanks hold more than just water. Tank farms store oil, wastewater, sand, detergent, livestock feed, and many other products. These tanks are also used widely in fracking, mining and related operations. Such versatility makes corrugated steel tanks a popular choice for a broad array of uses. Depending on your application, a corrugated steel tank may be the most suitable option for your needs. To find out more about storage tanks, contact the experts at GEI Works. Call (+1) 772-646-0597 or toll free at (888) 703-9889 for detailed information about these sturdy, versatile tanks. As rainwater pelts exposed soil at a job site, particularly on hills and slopes, it can cause a great deal of damaging erosion. There are many perimeter control products on the market – including erosion control blankets – designed to address this challenge. The question is, which are the most appropriate for use on a given job site? Is synthetic material more effective than natural fiber? What are some other considerations when using these products? Erosion is a daunting problem, not just because it disturbs the land and alters its contours. Washed-out soil particles make their way into lakes, rivers, streams and other aquatic habitats, creating excess turbidity and endangering ecosystems. It’s a matter of first importance that contractors do everything in their power to prevent this process from disrupting the surrounding environment. Failure to control erosion can lead to steep fines and project delays, throwing your job off schedule and out of budget. That hurts a company’s bottom line, as well as its reputation in the community. For many contractors, natural fiber products are the solutions of choice. The advantage such natural solutions as coir logs have over a simple silt fence is that you can leave the logs behind. They are completely biodegradable and help enrich the soil around them after breaking down. 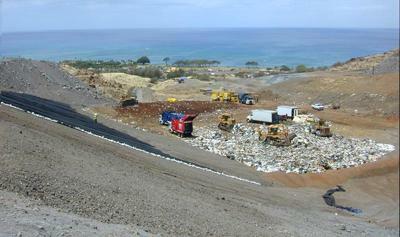 The geotextile silt fence is economical, but requires extra work in deployment, removal, storage and disposal. Erosion control blankets prevent runoff and allow vegetation to grow up through its fibers, promoting even greater stability for the soil. Your choice of a blanket will depend on several factors, including the time span the mat needs to remain on the site. If you need one to stay in place permanently, consider a UV-stabilized synthetic fiber. Unlike many of the others, this woven product will not break down and return to the soil. For that reason, it is not recommended for environmentally fragile areas, such as wetlands or other areas where wildlife may be affected adversely. The natural blankets are made of earth-friendly materials. Jute is a strong vegetable fiber easily woven together into ground-stabilization products, while excelsior is made from long, smooth wood slivers. Coir is derived from the fibrous material inside the first shell of a coconut and GEI Works incorporates these materials into various products: mats, logs, blocks, wattles and silt checks. For steep, high-flow areas where you want blankets to remain long-term, there is a semi-permanent coir option that lasts from four to six years. The product keeps critical slopes intact long enough for vegetation to take root and gain a lasting foothold. There is also a semi-temporary coir mat that breaks down in nine to 24 months. Made of 70-percent straw and 30-percent coconut fiber, these blankets are stitched between two organic jute nets. For shorter-term control in areas with low slopes, there are models available that break down in only six months; you can choose from jute, straw or excelsior mats. After selecting the appropriate erosion control blanket for your application, remove rocks, debris and other materials that impede the blanket’s contact with the soil. These mats are not suitable for use in rocky areas. Anchor the blanket to the soil using wire staples as recommended. Avoid use in areas where the vegetation will be subject to mowing, otherwise the mower may contact the staples. Be sure to inspect the materials during installation and after significant rainfall. Always compact the soil again in areas that have suffered erosion. By determining the right product for the job and installing it properly, you can more successfully slow or stall the pervasive erosion process that afflicts construction sites. Our technical support staff is standing by to help. 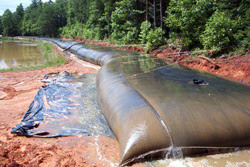 For more information on our line of erosion control solutions, contact the experts at GEI Works. A turbidity curtain keeps working 24 hours a day, so it’s important to take good care of it. A little common sense can help maximize the longevity of your investment and prevent failure. Turbidity curtains are like any other product: The more vigilant you are in maintaining it, the better the performance and the less chance of damage or excessive wear. The time invested in maintenance will pay dividends. And the process is simple if you follow some straightforward steps. The first question is, how often? The answer depends on where the turbidity curtain is installed and the application. In more demanding environments, such as marine applications with heavy traffic, you’ll need to inspect the curtain much more often. In conditions of high winds, currents or strong wave action, the recommended inspection frequency is daily. On the other hand, if you’re using a turbidity curtain in calm water with minimal traffic and fairly mild waves, every two to three weeks is OK. But make sure the time doesn’t slip away and you forget about it. A curtain in calm water still needs a periodic check. Another consideration is the discharge if the curtain is being used in the dewatering process. In that case, it’s important to check for sediment buildup weekly. If your site is in the path of an impending storm, it’s recommended that you remove the curtain before the inclement weather hits. If you can’t remove it in time, be sure to furl the skirt. Should a severe storm strike before you can remove the curtain, you should inspect it afterward to make sure there is no damage. Mishandling can itself result in damage, so be cautious when removing a turbidity curtain from the water. Planning and preparation are crucial here: Develop a coherent strategy for removing the curtain and always communicate it with the crew before the retrieval process begins. It should be a tightly coordinated effort, preceded by training for everyone involved. 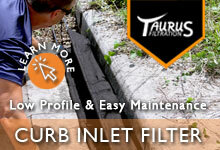 First, inspect the turbidity curtain for any marine growth. Aquatic organisms that fasten to solid objects can establish themselves in a brief time span. 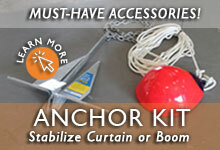 Locate and clean off any marine growth that appears on your curtain to stave off future problems. Look over the entire curtain to see if floating logs or other debris have caused any tears or punctures. The force of such objects can abrade or even punch holes in your curtain, causing the turbid water to pass through unabated into the surrounding area. Also inspect for any rips at the connectors. Remember, the proper height of a turbidity curtain is one foot from the bottom. You’ll want to check to determine whether the lowest part of the curtain has dropped or is buried in the sediment. If so, this will seriously impede its proper functioning. Inspect and remove any marine growth from mooring lines, connections and buoys, replacing them if excessive damage exists. If you have special accessories – lights or marine buoys, for example – give them a quick once-over to see if the batteries, solar elements or bulbs are working as they should. Inspect your anchoring carefully. Make sure the lines in the assemblies aren’t parted and that the anchor hasn’t shifted its position significantly. It may be useful to re-position and re-tension your anchors on occasion. 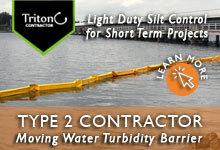 A properly functioning turbidity curtain can save a contractor from needless fines and project delays. Scheduling regular, proactive checks and quickly dealing with any damage will help the product perform optimally. 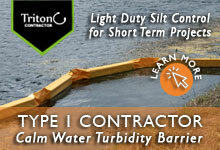 Contact the experts at GEI Works with any questions you may have about turbidity curtain maintenance. Call (+1) 772-646-0597 or toll free at (888) 701-9889. Humans were reshaping land before construction of the pyramids. Today, excavation and construction companies face one of the same problems as the ancients: erosion control. Erosion is the process by which natural forces wear away a land surface. Water, wind, ice and gravity act relentlessly upon soils, detaching them from their base and carrying them away – often into waterways. This happens frequently during rain as drops strike the soil, sending it airborne. On a construction site, shallow sheets of water can flow over the land and draw away loosened soil. Low areas are vulnerable to erosion as flows cut small channels to transport the washed-out material. The problems associated with erosion go far beyond issues of land shape and aesthetics. Runoff can transfer soils into lakes, ponds, rivers, streams and other waterways, fouling them with turbidity and excessive silt. According to the Florida Department of Environmental Protection, about 4 billion tons of eroded materials enter waterways in the United States every year. Erosion is bad news: It can disrupt storm water systems by plugging culverts and other areas designed to receive runoff. It also harms ecosystems by blocking sunlight in the water, inhibiting the growth of aquatic vegetation. Heavy turbidity can adversely affect fish populations by diminishing food sources, interfering with spawning and even clogging gills. One of the best means of controlling erosion is vegetative cover. It imposes a barrier between the falling rain and the soil, stabilizes soil particles, slows runoff velocity and promotes absorbency. Mulch can also be effective in slowing the erosion process. These measures are particularly important on long slopes and banks. But on a job site, such methods of erosion control are not always practical or even possible. That’s why contractors dealing with runoff issues should be eminently familiar with perimeter controls. One crucial line of defense is the silt fence. Erosion Control Silt Fencing from GEI Works is a highly effective means of handling displaced materials. They are available in three grades: Economy, Contractor and DOT Fabrics. Made of geotextiles, silt fences come in standard models and in reinforced wire-back models for greater strength. They are simple to implement, an indispensable tool in erosion prevention. 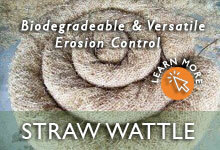 Other erosion control tools include a line of biodegradable mats, blocks, logs and wattles. Contractors can lay these over erosion-prone areas to keep them stable. GEI Works has a number of products made of coir, the material between the inner and outer shells of a coconut. These stay in place on the site for years until they decompose, enriching the surrounding soil. Coir Erosion Mats are effective in stabilizing slopes, hillsides and stream banks. Vegetation can grow up through the mats, further enhancing erosion control at the site. 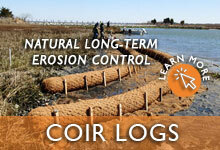 GEI Works also offers Coir Blocks, Logs and other products to shore up areas and prevent them from washing out. Removal of water from a project site carries the risk of discharging sediments that will find their way into area waterways. 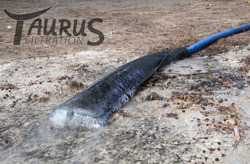 Taurus Dewatering Bags from GEI Works receive the discharge hose (2-, 3- and 4-inch) and fill up to capacity, filtering the exiting water safely from the sides of the bag. The debris and sediments stay behind for disposal. 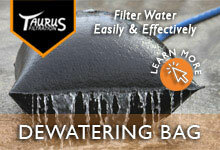 GEI Works also offers the Taurus Pipe Dewatering Sock for smaller applications. The larger, more heavy-duty Geotextile Dewatering Tubes are ideal for more substantial dewatering projects at such sites as agricultural ponds, paper mills and aquaculture facilities. 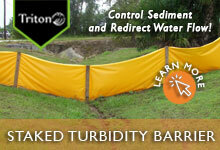 When erosion occurs and sediments do end up clouding a body of water, turbidity curtains are the last line of defense. The Triton line of turbidity barriers and silt curtains from GEI Works restrict suspended particles, promoting settling. Made to perform in varying levels of conditions – wave action, current, wind, etc. – the curtains hang in the water vertically and stop about a foot from the bottom, surrounding the source of turbidity. Suspended particles strike the curtain and change course toward the bottom where they settle beyond the containment area. Erosion is a force of nature we will always manage imperfectly. But with the proper tools and best management practices, contractors can wage an effective battle. GEI Works is your ally in that battle. For more information on erosion control products, please feel free to contact the experts at GEI Works. Hydraulic dredging removes sediment and debris from water bodies to maintain navigable waterways, nourish beaches, or perform environmental remediation. Dredging is not without its challenges, however. The amount of suspended silt or turbidity this process generates can be considerable, and can have a detrimental impact on the environment. Suspended particles in the surrounding water can seriously diminish water clarity, disturb ecosystems and release toxins. The disruption dredging can cause has led to the use of turbidity curtains as a best management practice to contain suspended sediment and comply with environmental policy. Turbidity curtains often stretch out in waterways at the perimeter of a jobsite or work area to enclose particles of silt and sediment suspended in the water column. A silt curtain consists of a surface flotation, a skirt and a ballast component. Challenging conditions call for the use of reinforced tension cables and connectors. The silt curtain skirt hangs vertically from surface floats and terminates about a foot from the bottom. Land or water anchors suitable for the conditions maintain the curtain’s position. Once in place, suspended particles strike the curtain skirt and are deflected downward where they can settle safely beyond the curtain perimeter. Various turbidity curtains are available, depending on the application. Pond dredging in calm water applications may require only a light gauge contractor-grade curtain with no additional reinforcement. In river dredging or open water conditions, a heavy-duty curtain with up to three reinforcement cables is often required. When used in conjunction with adequate anchoring, the cables allow the hydrodynamic force to transfer away from the curtain to the anchors, decreasing the stress on the containment system. The purpose of the turbidity curtain is to surround the point of origin and confine the turbidity as much as possible. 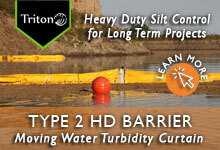 Effective silt control in any turbidity curtain application relies on many factors. Selecting the best model of curtain depends on site conditions: wave action, wind, current and other environmental factors. It’s important to collect site data to ensure not only correct selection of a curtain, but also its optimum deployment. Check the depth of the water with a bathymetric survey to calculate the correct height for the skirt. A tide gauge can calculate the fluctuation in depth. Also, the direction of water current, wave turbulence and area boat traffic are all important factors to consider in positioning and deployment. Position the curtain so it extends one foot from the bottom. Proper assembly geometry varies based on where the dredging is taking place. If near the shore, a semicircle is recommended with the ends anchored on land. Be sure to factor in tides and currents. In open water, there are a few options. If the current is flowing in one direction and doesn’t change with the tide, it may be acceptable to use a simple U-shape. If the current is prone to reversal, however, you’ll want to opt for an elliptical or circular pattern. The latter option lends itself to stronger anchoring, which is critical in keeping the curtain functioning at maximum effectiveness. The Triton Type 3 HD Curtains are designed for use in fast water with waves and other challenging conditions, making them a frequent choice for dredging operations. These robust curtains also have enhanced cabling across the top for greater stability. After deployment, be sure to inspect the curtain daily for any damage or failures. Check the flotation, anchoring and connectors to help ensure continued performance. Keep it clean of marine life or other natural contaminants. Selection, preparation, deployment according to specs, and daily maintenance – these will go a long way toward peak turbidity control at a dredging site. A little extra care will help you avert problems along the way and complete a successful, trouble-free operation. Contact the experts at GEI Works for more information on turbidity curtains. Call (+1) 772-646-0597 or toll free at (888) 701-9889. Storms swirled off Hurricane Joaquin in early October, dumping historic levels of rainfall on South Carolina, flash-flooding populated areas, and overwhelming dams. On Oct. 3, Charleston recorded rainfall that ranged from 10 to 13 inches – record levels, according to the National Weather Service. The state is facing a possible $1 billion in cleanup and will be receiving federal disaster aid. The storm’s death toll reached 17 in South Carolina, where 250 roads and 100 bridges are still closed. Coastal areas of North Carolina were also affected by the devastating storm. The evening news covers these storm stories in detail. But the intricate planning and preparation that goes into such emergency responses often gets scant coverage. Behind the scenes is the unfolding of a process, carefully crafted to ensure minimal disruption and loss of life. When states, counties and communities are faced with natural or manmade disasters, preparation is essential. That’s why these governing entities have supplies and equipment in advance of the storm. It better enables emergency personnel to enter harm’s way and respond to the profuse human needs in the disaster’s wake. Items that help safeguard infrastructure from floating debris, water contamination and other storm hazards are already in storage long before the event’s forecast. Planning allows emergency personnel to help survivors, keep infrastructure in place, and pave the way to recovery. Among the first considerations is ensuring that potable water is available when a storm fouls existing supplies. 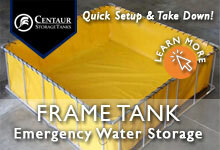 One solution is to bring in a reservoir or tank for setup in an easily accessible area. Open-top or self-contained flexible tanks are a popular option among many emergency response teams because of their compact storage, lightness and small number of moving parts. The onion tank, named for its shape, is an open-top tank. Flexible and collapsible, the tank stores easily. When emergency response teams send in tanker trucks of potable water, the hose connects to a fitting on the onion tank. Its walls rise automatically to contain the water as the tank fills. Once drained of water, the tank’s PVC material won’t rot or grow mildew, and can be returned to storage safely. The drinking bladder water tank is another option. These flexible “pillow” tanks lie flat and can store up to 210,000 gallons of drinking water. Because both the bladder and onion tanks are collapsible, they require only minimal space for storage, making them an optimal choice for disaster preparedness. Floating booms are also important for the control of debris headed into flooded areas, water intakes and bodies of water. 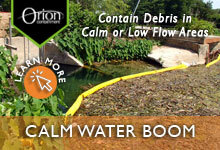 Debris booms are an effective means of either deflecting or containing buoyant trash. Absorbent booms are deployed to control the spread of hydrocarbons or chemicals that can be released during a flood, further minimizing the negative impact on the environment. Once the flood waters recede, a host of challenges remain. Low-lying areas where pooling remains will need to be pumped out. But simply pumping stormwater runoff into storm sewers or area waterways can introduce contaminants and high sediment content. This creates turbidity and other pollution problems that disrupt fragile ecosystems. Cleanup teams can pump large dewatering bags full of the sediment-laden water. These bags are made of a filtering geotextile that permits water to escape, leaving the suspended materials in the bag for disposal. Dewatering tubes function in the same manner but can accommodate much greater quantities. 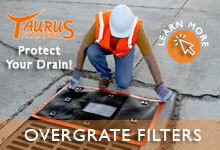 Geotextile filters protect grates and stormwater drains from contaminants that are all-too-easily transferable into surrounding waterways. These best-management practices are another critical component of environmental protection after a storm. When the rebuilding process begins, a supply of erosion-control products can help with the growth of vegetation and prevent the washout of new soil trucked in. One part of a sound, land-stabilizing strategy is the use of naturally based coir products – logs, soil blankets, wattles and other sediment control solutions made of biodegradable coconut fiber. They impede erosion, allow vegetation to grow from underneath, and nourish the soil after finally breaking down. Having silt fencing and geotextiles ready to go can provide much-needed support and retention for exposed areas. This prevents delays and helps response teams get started on the many tasks at hand. So be sure to consider exactly what your region might need in case of a disastrously “rainy day.” Prepare yourself and get a jump on the event so you can help lessen its catastrophic impact before it strikes. Call the experts at GEI Works for more information. Call (+1) 772-646-0597 or toll free at (888) 701-9889. Toxic spills occur with great frequency in and around the United States. In most cases, containment and cleanup are routine. But the Environmental Protection Agency spill that began Aug. 5 and eventually dumped 3 million gallons of toxic mine waste into the Animas River captured the public’s attention. The yellow and orange river water quickly stretched 100 miles into three states, carrying such toxins as lead, arsenic, copper and mercury. The EPA itself accidentally released this massive flow of waste from the King Mine, abandoned in the 1920s. Consequences have been far-reaching. The Animas River provides water to residents of Colorado, New Mexico and Utah who live along its banks, and is an important source of irrigation for farmers. The disastrous magnitude of this spill was immediately evident, even to the casual observer. As the EPA labors to address the fallout of this extensive spill, containment and remediation are matters of utmost importance, obviously. The federal government recently announced plans to open a temporary treatment system on Oct. 14. Early cleanup response to this incident included the construction of plastic-lined retention ponds to pump in and contain some of the tainted water before it spreads further. These liners are part of a diverse and prolific assortment of products that contribute significantly to the process of spill remediation whenever an environmental accident occurs. Heavy-duty pond and lagoon liners are made of reinforced PVC and other materials that prevent seepage into the ground. They are designed to hold water, sludge and waste, depending on the nature of the incident. One remediation method in retention ponds involves deploying a series of floating PVC curtains in a baffle pattern. The baffles are positioned in a staggered configuration, forcing the flow of water to move from one side of the pond to the other. The action sets up a natural electrical charge that promotes settling of the toxic particles. Spills come in many types, and so do spill remediation products. If the accident is an oil spill on the water, special containment booms are designed to surround it quickly before it fans out into other areas. Made of expanded polyethylene foam and PVC plastic, the anchored boom floats to form a ring-like barrier that protects the rest of the waters and facilitates cleanup. 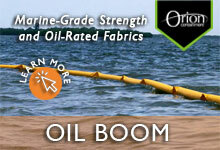 Special absorbent booms not only encompass the spill, but also help soak it up at the perimeter. Fire-resistant booms allow for the process of in-situ burning, in which the crew ignites the oil spill to burn it off safely. Various boom models are on the market to address the conditions at deployment, whether the water is calm, fast or open. Dewatering bags and tubes can often be useful on a spill site. Cleanup workers fill the bags with contaminated water under a stringent monitoring process. The filtered water gradually passes through the sides of the bag, leaving the sediment and pollutants behind. Dewatering tubes, also known as sludge tubes, are much larger than the bags – sometimes 200 feet long. They are also made of a heavier material but work according to the same process as the bags, despite holding far greater quantities of water. Tubes are filled and refilled until the solids left behind reach 85 percent of the inside space and are ready for disposal. Chemical treatments are available that promote flocculation, a process that causes fine particulates to clump in masses for easier cleanup. The treatment is sometimes added while the contaminated water is in a dewatering bag or tube. One area of cleanup not always readily apparent is the need to keep vehicles on the site from spreading contaminants. As contaminated trucks and other vehicles undergo a wash-down, it's crucial to have portable spill berms positioned underneath to catch the water for safe disposal. These berms are shallow holding units with walls that bounce back, so a vehicle can drive over them for a wash-down. Downstream from the spill site, it is imperative that there be storage available for drinking water, fuel or waste. 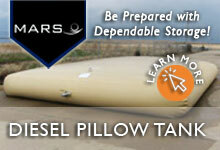 Many different sizes of pillow tanks (or flexible storage containers) are available, simple to transport and store. They range in size from 25 to 210,000 gallons. 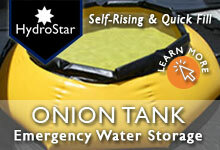 Onion tanks – named for their distinctive shape – are easy to deploy, with their self-rising and self-supporting walls. Storage tanks made of steel, fiberglass or plastic provide more long-term storage of liquids. When it comes time to dispose of items that have been contaminated with pollutants during the cleanup, portable incinerators get the job done. Ridding the site of such items without spreading the contamination is a vital part of the process. A spill is obviously an extremely unwelcome event. But tools such as those in the Kraken and Triton product lines of GEI Works help make restoration possible. Whether it’s a small oil spill on a lake or 3 million gallons of waste released into a river, GEI Works has many products helpful in addressing the situation. Contact the experts at GEI Works for more information. Call (+1) 772-646-0597 or toll free at (888) 701-9889.